The North Koreans are reportedly preparing to put the People's submarine out to sea for a Christmas missile launch. Commercial satellite imagery showed ambiguous signs that North Korea’s GORAE-class, experimental, ballistic missile submarine is preparing to depart Sinpo. According to the imagery analysts at 38 North, the netting that usually covers the submarine and a submersible test barge has been removed. There are many reasons the netting would be removed, but it is always removed before leaving port. Last week, open sources reported that North Korean engineers conducted land-based testing of the KN-11 submarine launched ballistic missile. In that context, a departure for an at-sea test should be expected. The Norks don't celebrate Christmas so in their typical Grinch-like behavior, they want to ruin it for a lot of other people by causing them to have to work on Christmas. Fourteen Turkish soldiers were killed and 33 wounded in clashes with the Islamic State (ISIL) fighters at al Bab in northern Syria. Turkey claimed its forces killed 138 ISIL fighters. “Once this area has been seized, Daesh’s (ISIL) dominance of al-Bab will, to a large extent, be broken,” it said in a statement, using an Arabic acronym for the group. ISIL was using suicide bombers and vehicle-borne explosives intensively, it added. Syrian news services report that the evacuation of Aleppo continued on 21 December despite a snowstorm. Government forces have halted movements to enter the last rebel neighborhoods until the evacuees are gone. After that President Asad is expected to declare the liberation of Aleppo complete. This is the highest number of casualties the Turks sustained since President Erdogan sent Turkish Army units into northern Syria on 24 August. The ISIL fighters at al Bab have put up stiffer resistance than the Turks expected. Thus far, the Turk’s so-called anti-terror campaign, Operation Euphrates Shield, has faltered as clashes occurred beyond the immediate border. Al Bab is about 18 miles from the Turkish border. As the holidays approach, things become more desperate. Los Angeles County Supervisors, in a bid to retain their voting base (illegal aliens vote in LA), the LA County Board of Supervisors voted 4-1 to waste $3 million from the PEOPLE's TREASURY on lawyers for illegal immigrants/wetbacks/undocumented persons. I have been cautioned that some people find that my observations make others feel uncomfortable. 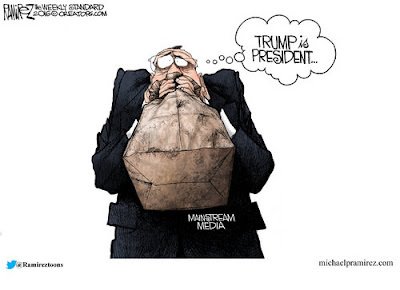 The corrupt elite media is still in melt-down mode that Donald J. Trump will be the 45th President of the United States and that his cabinet picks signal a reversal of the Obama Years. We hear the word "impeachment" thrown around a lot by the progs even though President Trump has not taken office yet. That's clearly the next axis of attack. Social justice warriors say that President Trump will be acting in conflict of interest even though US law indicates that a president has immunity from those laws - and always has had. But never fear. When do you know a prog who actually followed the law? They prefer to guide the nation with 'feelings'. And not just any feelings - their feelings - only theirs. Nobody else's. That's what passes for inclusion the prog world and if you disagree with them, you're a racist homophobe. The progs insist that they're just getting ready to throw him out - and replace him with Vice President Pence, who is more hard-line in almost all respects than President Trump. I bought a twelve-pack of microwave popcorn the other day. No, I don't fly on United Airlines unless there is absolutely no other option. But to the point, I've been jet-setting around this holiday season because that's how I make money. I have been vetted by everyone, I have a TSA Pre-Check certification, a US Customs and Border Enforcement SENTRI card, I am certified by Global Entry, I carry other retired credentials from when I worked for a living, I carry a passport book and a passport card with an RFID chip in it, etc. TSA bounced me off pre-check into the herd and I found myself standing in long lines to take off my belt and get wanded and then patted down anyway. I asked a TSA official why my status wasn't recognized. She said it was because of heightened concern of a terrorist attack. She said that because they can't profile passengers, they essentially are screwing with everyone despite credentials that can be verified 100%. And this is the problem. The only effective way to screen passengers is to profile them. The Israelis figured this out many decades ago. When is the last time an El Al jet was blown up or hijacked, and they are target one? Even the Germans profile. They profiled me to death the last time that I flew through Frankfurt. I'm fine with that. But the reality is that Muslims and more particularly military age Muslim males account for somewhere on the order of 100% of the security problems that airlines have. A few years ago I traveled to Athens with a Middle Eastern Muslim male who is the very poster child of a terrorist. The Dutch stripped him to his birthday suit just for shits and giggles and harassed me because I had been seen speaking with him. I don't blame them. 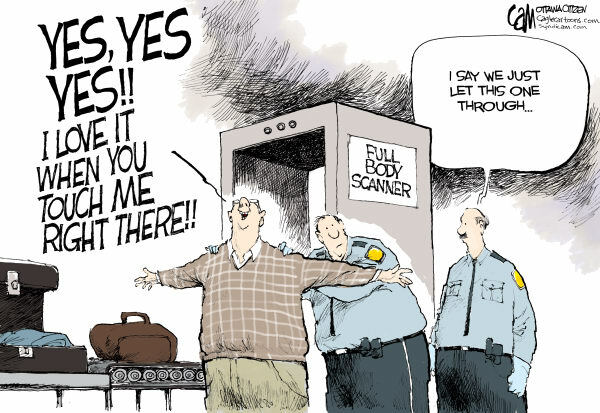 That's precisely what they should be doing, but TSA is uncomfortable with that. When is the last time that a sixty year old white male who has been vetted, screened and probed his entire life and can prove it caused a problem in the air from his seat in first class? I didn't even complain when the shrimp salad on American Airlines was wilted and a bit nasty. The pasta on the shrimp salad was maggot sized and I looked hard to make sure that they didn't move before trying to eat it. And even THEN, I didn't complain, but I asked for two hot chocolate chip cookies by way of compensation -- but that's it. I get up from my aisle seat to let the person who has the window seat piddle and never complain. I just want to get the flight over so I can do what I need to do and return home. But TSA, which misses 95% of guns, knives and bombs in testing, insists on screwing with the very people who would work to thwart a hijacking if one were to take place. Ok, I got that off my chest. Merry Christmas, Feliz Navidad, Lave sus Manos and all that fancy stuff.